In Greek mythology the Sirens or Seirenes (Greek Σειρήνες or Acheloides) were creatures who lived on a remote island surrounded by rocky cliffs, later identified as Sirenum scopuli. The Sirens lured passing sailors by their singing, which would enchant any sailor listening to the point that he would lose all will-power, and crash his ship upon the Sirens' rocky shore and cliffs, killing all the men aboard. 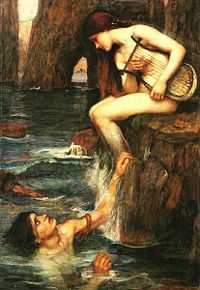 While the Sirens were used frequently by the most famous of the classical authors (Homer's The Odyssey and Jason and the Argonauts), they appear rarely in contemporary fiction. There is the possibility that they influenced Northern Europen tales of mermaids, legendary aquatic creatures with the head and torso of human female and a fish-like tail. The legend of Loreley of the Rhine, who sang to lure sailors to their death on the rocks below, shows clear parallels to the tales of Sirens. There is, however, no evidence of the existence of Sirens in reality. Sailing was a very important part of ancient Greek life, but the waters of the Mediterranean were very dangerous and the epic literature of the times reflected this awe and fear of the sea. It is most probable that out of these mixed feelings for the waters came the seed for the Sirens, reflecting the communion that sailors feel with the ocean, one that is both beautiful and deadly. Originally, not much was known about the Sirens, because anyone drawn to their calls never came back alive. However, later Roman authors expanded on the idea of the Sirens, laying out the general depiction known today. Their number is variously reported by such authors as between two and five, and their individual names as Thelxiepia/Thelxiope/Thelxinoe, Molpe, Aglaophonos/Aglaope, Pisinoe/Peisinoë, Parthenope, Ligeia, Leucosia, Raidne, and Teles. As far as parentage, they have been linked to Phorcys, Achelous, Melpone, Sterope, and Terpsichore. It was Ovid who came up with the tale of their origin—the Sirens were playmates of young Persephone and were changed into the monsters of lore by Demeter for failing to intervene when Persephone was abducted. It has been suggested that the Siren is actually the precursor for the Northern European mermaids, half-women and half-fish creatures that lured individual sailors into the water, where they were drowned and eaten. In fact, the words for mermaid in Spanish, Siren, French, Sirène, Italian, Sirena, Polish, Syrena, and Portuguese, Sereia, show the connection between the Siren and mermaids. However, it should be noted that while the Sirens were an influence, in the English language, Siren and mermaid are not used interchangeably. Also, merpeople were often present in Greek mythology distinct from the Sirens. For example, the sea god Triton, son of the King and Queen of the Sea, Poseidon and Amphitrite, is usually depicted with the upper torso of a man and the tail of a fish. In early Greek art the Sirens were represented as birds with large heads and scaly feet, and sometimes manes of lions. Later, they were represented as female figures with the legs of birds, with or without wings, playing a variety of musical instruments, especially harps. The tenth century encyclopedia Suda says that from their chests up Sirens had the form of sparrows, below they were women, or, alternatively, that they were little birds with women's faces. Birds were chosen because of their characteristic, beautiful voices. However, later in history, Sirens were sometimes also depicted as beautiful women (whose bodies, not only their voices, were seductive). There are two main legends that directly deal with the Sirens. The first is the story of Jason and Argonauts. While at sea, Jason and his crew become mesmerized by the distant song of the Sirens. The crew immediately changes direction towards the song, heading on a crash course with the rocky cliffs. The only crew member not to be enchanted was Orpheus, who realizing what was happening, drew his lyre and played his own music, which was powerful enough to drown out the Sirens call and break the enchantment. One of the crew, however, the sharp-eared hero Butes, continued to hear their song and leaped into the sea, but he was caught up and carried safely away by the goddess Aphrodite. Odysseus and the Sirens. An 1891 painting by John William Waterhouse. The other infamous encounter with the Sirens takes place in Homer's The Odyssey. 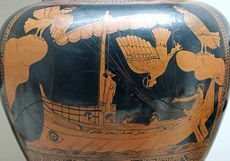 Upon leaving the island of Circe, Odysseus is warned that in order to travel the route back home to Ithaca, he will have to pass by the island of the Sirens. Ever the schemer, Odysseus comes up with the idea to plug all the ears of his crew with wax, so that the sounds of the Sirens would be blocked out. However, curious as to what the Sirens actually sounded like, Odysseus orders himself tied to the mast of his ship, while they pass; the songs of the Sirens seduce Odysseus, promising him knowledge and power if he follows the sound, except his ropes keep him in place and the entire crew makes it safely out of the Sirens' range. Because of the prophecy that the Sirens would die if anyone escaped their call, after Odysseus and his crew sailed safely by the island, the Sirens reportedly fell into the ocean and died. Later legends stated that the Sirens were actively engaged with the process of death, watching over those who are about to die and even sometimes accompanying the soul to the netherworld. In contrast to their earlier malicious nature, people claimed that the Sirens were sensitive beings, who even would mourn for the dead at funerals. Because of the resurgence of interest in Classical literature during the European Renaissance, the Sirens were often used in fictitious narrative and poetry. Like many other aspects of ancient Greek mythology, the Sirens were often employed as narrative devices, such as allusions, and outside of the Roman authors, few actually delved deeply into the personal story of the Sirens. Yet, the Sirens survived, and continue to be used in fiction and new forms of literature, such as television and film. In pop culture, the Siren is sometimes used in video and role-playing games, mentioned occasionally in comic books and music. Sirens are sometimes considered to be the forerunners of the German Loreley (also written as Lorelei). These creatures were named after a rock on the eastern bank of the Rhine near St. Goarshausen, which soars some 120 meters above the water line, marking the narrowest part of the river between Switzerland and the North Sea. A very strong current and rocks below the waterline have caused many boat accidents there. ↑ Micha F. Lindemans, "Sirens" Pantheon.org. (1997). Retrieved May 29, 2007. ↑ Edith Hamilton, Mythology (1942). ↑ Carlos Parada, "The Sirens" (1997). Retrieved May 29, 2007. ↑ North Star Gallery, "Mermaids and Sirens" (2002). Retrieved June 15, 2007. ↑ Dr. Manfred Halfer, Loreley—in Beitrag zur Namendeutung. Retrieved June 16, 2006. This page was last modified on 22 September 2015, at 16:16.